Klosterman was born in Breckenridge, Minnesota, the youngest of seven children of Florence and William Klosterman. He is of German and Polish descent. He grew up on a farm in nearby Wyndmere, North Dakota, and was raised Roman Catholic. He graduated from Wyndmere High School in 1990 and from the University of North Dakota in 1994. After college, Klosterman was a journalist in Fargo, North Dakota, and later a reporter and arts critic for the Akron Beacon Journal in Akron, Ohio, before moving to New York City in 2002. From 2002 to 2006, Klosterman was a senior writer and columnist for Spin. He has written for GQ, Esquire, The New York Times Magazine, The Believer, The Guardian, and The Washington Post. His magazine work has been anthologized in Da Capo Press's Best Music Writing, Best American Travel Writing, and The Best American Nonrequired Reading. Though initially recognized for his rock writing, Klosterman has written extensively about sports and began contributing articles to ESPN's Page 2 on November 8, 2005. In 2008, Klosterman spent the summer as the Picador Guest Professor for Literature at the Leipzig University's Institute for American Studies in Germany. Klosterman was an original member of Grantland, a now-defunct sports and pop culture web site owned by ESPN and founded by Bill Simmons. Klosterman was a consulting editor. He also appeared in three episodes of the Adult Swim web feature Carl's Stone Cold Lock of the Century of the Week, discussing the year's football games as an animated version of himself and trying (unsuccessfully) to plug his book as Carl cuts him off each time. He quickly vanished after, with Carl giving the explanation of "He had to go do a book tour and also he didn't like how I kept calling him 'pencilneck'". In 2012, Klosterman appeared in the documentary Shut Up and Play the Hits on musical group LCD Soundsystem; Klosterman's extended interview with the group's frontman James Murphy is woven through the film. In 2015, Klosterman appeared on episodes 6 and 7 of the first season of IFC show Documentary Now! as a music critic for the fictional band "The Blue Jean Committee". His eighth book, titled I Wear the Black Hat, was published in 2013. It focuses on the paradox of villainy within a heavily mediated culture. His best-selling ninth book, But What If We're Wrong? Thinking About the Present As If It Were the Past, was published June 7, 2016. It visualizes the contemporary world as it will appear in the future to those who will perceive it as the distant past. Klosterman is the author of ten books and a set of cards. In 2009, Klosterman married journalist Melissa Maerz. They have two children. ^ Knudson, Pamela (10 August 2018). "N.D. native, author Chuck Klosterman forges career — his way". Jamestown Sun. Retrieved 23 August 2018. ^ "Tony DuShane | Chuck Klosterman – An Awesomely Long Interview". The Nervous Breakdown. November 12, 2011. Retrieved 2012-11-13. ^ Klosterman, Chuck (April 27, 2003). "Everyone Knows This Is Somewhere". The New York Times. Retrieved January 8, 2010. ^ Chuck Klosterman, "Rubber City Meets the Crossroad," The Village Voice, 15 October 2002. ^ Klosterman, Chuck (November 8, 2005). "Just keep my sports the same". ESPN Internet Ventures. Retrieved November 3, 2009. ^ American Studies Leipzig, "New Picador Professor Chuck Klosterman," 28 May, 2008. ^ "All-Star Roster of Writers and Editors to Join New ESPN Web Site". Archived from the original on April 30, 2011. Retrieved April 29, 2011. ^ "HYPERtheticals by Chuck Klosterman". Random House. June 15, 2010. Retrieved June 3, 2011. ^ "I Wear the Black Hat | Book by Chuck Klosterman – Simon & Schuster". Books.simonandschuster.com. Retrieved 2012-11-13. ^ Holt, Jim (June 29, 2016). "The Good, the True, the Beautiful and Chuck Klosterman". The New York Times. Archived from the original on July 2, 2016. ^ Dresser, Ashley (September 30, 2009). "Klosterman and Maerz: two hipsters say "I do" | mndaily.com – Serving the University of Minnesota Community Since 1900". mndaily.com. Retrieved June 3, 2011. 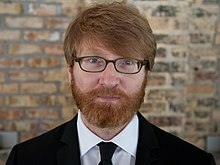 Wikimedia Commons has media related to Chuck Klosterman.